Making your home just the way you want it! Enhance and beautify your home when you speak with the carpenters of Old Bedford Fine Custom Carpentry about our professional custom built-in furniture and custom entertainment centers! Contact us today in Danbury, CT to learn more about the array of services we offer! 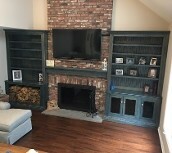 "We are very pleased with the wall unit/entertainment center and fireplace mantel that Old Bedford designed and built for us. Every time we walk into the room we are reminded what a great job they did and reaffirm our decision to build it. And, our friends and family admire it as well. Len met the challenge posed by us to customize an unusual blue stain for our project. It truly is the centerpiece of our great room, beautifully framing the fireplace. We highly recommend Len & Old Bedford, love his work and look forward to working with them again"
"After searching for full-over-full bunk beds that could safely sleep kids as well as adults, we decided we needed something contemporary & custom built-in to wall that matches the look & feel of our guest house. 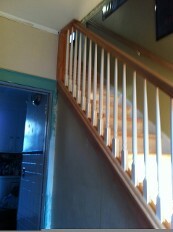 From first meeting, it was clear that Len & Old Bedford Fine Custom Carpentry would give us exactly what we envisioned. Len was trustworthy, punctual and easy to work with. He brought to life our vision from just a few inspiration photos. We couldn't be more thrilled with the results. We love Len's work and highly recommend him & Old Bedford for your projects." "Len was a pleasure to work with. He clearly cares a lot about the work he does and makes sure that he gets it right. He really made our vision come alive and it looks incredible! Len came to our house as many times as necessary to discuss any questions I had or concerns and really made me feel like I was in good hands!" "Len came up with creative solutions to a couple of dilemmas in our living room, and he embraced the challenge. Our custom shelves have transformed the room, and he framed the huge, old mirror over the fireplace so that I love it now, and I used to really hate it! He always responded promptly to any communication. We're thrilled with his workmanship and professionalism, and we plan on using him again for other projects." 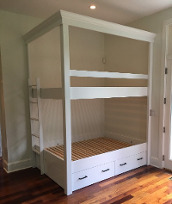 "Len & Old Bedford Fine Custom Carpentry have done three major built-in furniture projects for us this past year in our new home - in my husbands office, in my sitting room and in our bonus room. Needless to say, we are extremely pleased with the work and how it has transformed each room into a warm living space. His design, fabrication & installation skills, as well as his vision and commitment to each project, were outstanding. We highly recommend Old Bedford for your projects. If we hadn't run out of projects he'd still be working here!" 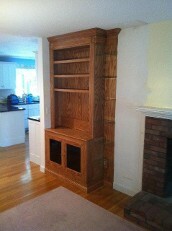 "I can not say enough great things about Old Bedford Fine Custom Carpentry and especially Len. The way he came in and collaborated to understand exactly what we wanted and then brought it to life was amazing. He took a dead unusable space of our house and made it the focal point of the room. The attention to the details and how the design fit so well in the space is just extraordinary. If you are thinking about a project like this, then Len and Old Bedford should be your first call." "I didn't want to close out the year without letting you know how beautiful and much appreciated our new bookcase has been. Attached are pictures of the work you did in our home. Thank you for the gorgeous craftsmanship, your kindness and great professionalism during this entire project. Having you develop and build what was really just a dream for Peter and I has really helped us start to think about next steps in decluttering our home. Hope to connect in the new year." 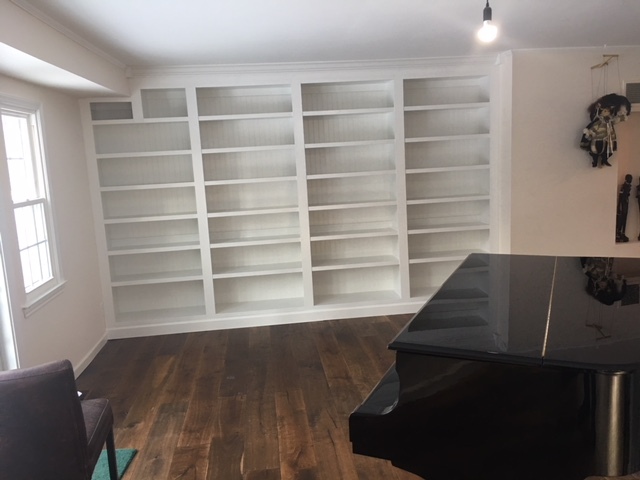 "I am so pleased with my piano surround custom bookcases for my sheet music & publications. Len listened to what I wanted and offered ideas for style & size. Courteous and professional, answered email questions and requests promptly. Worked with me to schedule convenient installation time. I highly recommend Len & Old Bedford and would definitely use again for another project." Looks so good floating without legs. Len you did such an amazing job." "Len proved himself to be a great craftsman and partner in this project, and we look forward to having him work on more projects in our house. 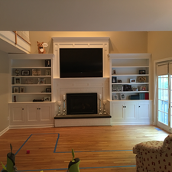 We had a "vision" to have a library area and custom cabinetry for a 50" TV built in the living room of our Colonial-sized house, as well as moldings installed throughout. It would be a big job in a long, rectangular area, and we didn’t realize how unformed our vision of the room was until Len’s first visit. He has a gift for objectively helping you figure out the best way to approach the job, suggesting options and remaining flexible throughout. We have gotten so many compliments on the room, and we love how it’s now so refined-looking and, at the same time, cozy." "Among the many things we appreciated about working with Len is that he was conscientious and completely focused on our project. He was there every day, without fail. We’ve worked with a number of contractors and have found that that’s not always the case. He also kept the work area tidy, and we felt incredibly comfortable having him in our house while we were at work. He also did a nice job with the painting and other finishing touches. We’re happy to recommend Len, and as I mentioned previously, we’re looking forward to hiring him again." "We Found Len and Old Bedford Fine Custom Carpentry on the Internet and we think they're a real Internet find. 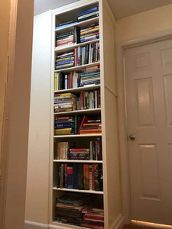 Len helped us design an 11 foot long, floor to ceiling built-in Library shelving unit, incorporating all of our design ideas and we are thrilled with the result. It looks like its always been there and that's a statement about how well Old Bedford designs and builds its built-ins. All work was completed on a timely basis, at a very reasonable price with virtually no disruption to our home. 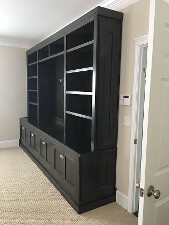 We strongly recommend Len & Old Bedford Fine Custom Carpentry for your projects"
"Len and Old Bedford designed, fabricated and installed a built-in floor to ceiling combination entertainment/cabinet/bookshelf wall unit. Len's approach was very helpful in providing me with detailed drawings and options for the finish. For example, if I wasn't sure about whether to use stain or paint on the entertainment center, he recommended starting with stain since it could always be easily painted over later." "Old Bedford & Len really transformed several rooms in my house with built-in furniture. 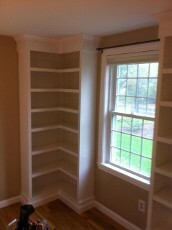 In this 2nd project, they built a corner bookshelf unit in my guest bedroom. Everything was made to look like it always belonged there with the use of crown and base board molding. I am very satisfied with the work of Old Bedford and will use them for future projects"
"Old Bedford & Len really transformed several rooms in my house with built-in furniture. In my office, he built a corner unit that included cabinets, a desk and shelving to the ceiling; in a bedroom, he built 9 feet of book shelves; and in the master bath, he built a stunning wall cabinet with bead board doors. 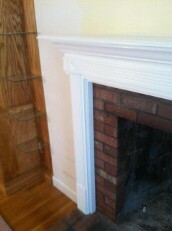 Everything was made to look like it always belonged there with the use of crown and base board molding. 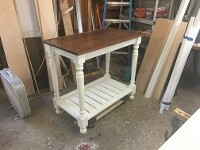 I am very satisfied with the work of Old Bedford and will use them for future projects"
"We love our new cabinets from Old Bedford Fine Custom Carpentry. Len really put a lot of effort and thought into our projects. You could tell that he just didn't build something and quickly throw it up. He paid a lot of attention to detail and quality. Now I'm trying to figure out other projects I can give him"
"I just wanted to write and say that we absolutely love our bookcase/entertainment center. Today I had some ladies here for lunch to have a look at it. One will probably be calling you for some work at her apartment down the street. Len was very pleasant to work with. He is very helpful, knowledgeable, neat, punctual, and professional. The completed work was just what we asked for. We are certainly going to ask Len to help us with our next project!" "Len came to our home, sat with us and listened to our concerns and goals for our project. He then provided a drawing reflecting our conversations and with our approval proceeded to design, fabricate and install a perfect built-in cabinet solution for our family room electronics with pricing that we thought was very reasonable. We will use him again in the future. We recommend Len & Old Bedford Fine Custom Carpentry for your projects"
"I found Len and Old Bedford Fine Custom Carpentry on the internet. I had been planning a custom cabinet and canopy for my saltwater reef aquarium for several years. I wanted the cabinet to match the look of the existing aquarium stand, and at the same time become an integral part of the maintenance routine which a reef aquarium entails. I had very specific needs for this unit since it was to be built around the existing aquarium setup, which could not be moved at all. Len took all the necessary measurements and we discussed options for the build. A few short weeks later he showed up with the unit he had built off-site, and it came together beautifully around the aquarium. It upgraded the look of the entire room, and even made the aquarium itself look better! I was amazed at his precision craftsmanship, attention to detail, and the cleanliness of his work habits. I would use him again in a heartbeat, or when I get a bigger aquarium! I highly recommend Old Bedford Fine Custom Carpentry"
"We showed Len a picture of something we liked for an entry way combination bench and wall unit from the Pottery Barn. Len duplicated it to our specifications for a smaller space and even fabricated rounded edges to make it more child safe when my kids use the bench. We are very pleased with the result and will use Len & Old Bedford Fine Custom Carpentry for projects in the future and would recommend him for your projects." 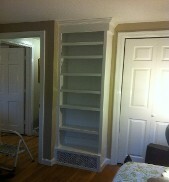 "We were happy with the results of the bookcases. They came out just as designed and were done in a timely manner. Len was also very neat and tidy. " "I found Len on craigslist and contacted him to build a wall of pretty bookshelves for my mid-town Ventura home. His professional manner and practical ideas resulted in a lovely wall of maple wood shelves, built in less time than expected. His bid was reasonable and his work style methodical and consistent. He checked with us several times to make sure of what we wanted. 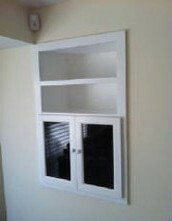 We are thrilled with the resulting built-in furniture-- it's beautifully made by a pro. Our 1950's style home is certainly better for Len's work. We'd recommend this artisan without hesitation." "This must be the 3rd or 4th project Len & Old Bedford has done for us and it really was special. We have a cupola observatory at the top of our house and Len designed and built-in a combination library/seating unit, running 20 feet along three walls. We really love the result. It's like a sanctuary for us - and he did it for less than 1/2 the price of other qoutes we received. That's what you get with Old Bedford - great pricing and top quality work. Len really does "make your home just the way you want it!" "This is one of the several rooms in my house Len & Old Bedford Fine Custom Carpentry transformed with Built-in Furniture. 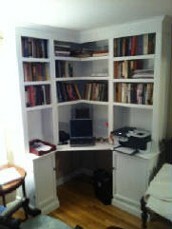 This is my office and I needed as many book shelves as possible. We fit this floor to ceiling into a small space otherwise unused because of the air exchange in the floor. I am very satisfied with the work of Old Bedford and will use them for future projects"
"I am beyond impressed with Len at Old Bedford. I am hard to please and the final product is just beautiful! He did a 13 foot built-in entertainment center for me and I will have him back next year to do a bar to match. I highly recommend Old Bedford." "Since you built the wall of shelves we have had family and friends over and everybody thinks the shelves are just fabulous. I think it looks just great. So we are looking forward to another masterpiece of craftsmanship when you build the entry foyer bench." "Len is a master of his trade and a true visionary. We needed a custom built-in that was functional for the small space we had, and Len made our vision come to life in a way that was better than we had ever imagined. There is nothing we would have changed. His attention to detail is outstanding, and the quality of the materials he uses is top notch. Len is professional, reliable, true to his word, and all around a great guy. Best of all, his services are affordable. We will not hesitate to call Len again for our next custom project. And you shouldn't, either!" 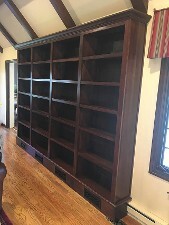 "My new library bookcases are the best upgrade I've made to my house. Superb attention was given to every detail - craftsmanship, style, crown molding, quality of wood, a stain that perfectly matches the trim in the rest of the room. Beautiful! I couldn't be happier." "I went to the islands for vacation when the work was started and when I returned I had these beautiful new railings. 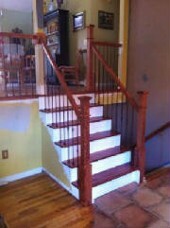 I am very pleased with the new stair railing's installed by Old Bedford Fine Custom Carpentry. They really are lovely!" 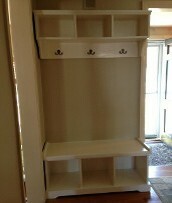 "A pleasure to work with Len from Old Bedford Fine Custom Carpentry. Fine craftsmanship down to the smallest detail and completed earlier than projected and on budget. Offered suggestions to enhance the final result. 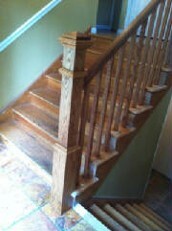 We would definitely contact them again and highly recommend Old Bedford Fine Custom Carpentry." "Before Old Bedford's work, we did not have railings. 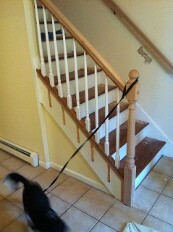 There was only a drab half wall all the way up the stairs. Len remove the four sections of the wall, installed an attractive oak covering and railing system with iron scroll balusters. The result is just what we had hoped it would be and we are very pleased. 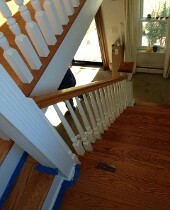 Thank you Old Bedford Fine Custom Carpentry!" 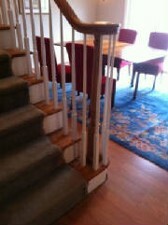 "As you can see from the photo, we have a lot of stair railing in our house with some tricky interaction. Len and Old Bedford did a great job in designing and installing the new railing system. It's become a major focal point drawing a lot of compliments. 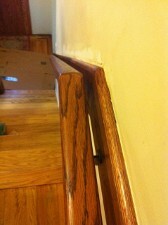 We highly recommend them for your stair railing project." "Len did an excellent job on a project that other carpenters refused to undertake. His craftsmanship and professionalism impressed us throughout the entire process. 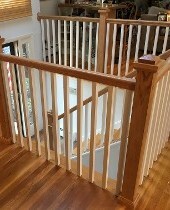 We would recommend him to anyone in need of fine carpentry work requiring both skill and creativity"
"We are happy with the results of the stair railings. They came out just as designed and were done in a timely manner. Hope to be able to recommend Len to friends"
"We hired Len to replace an old wrought iron railing. He did a great job. His attention to detail is excellent. 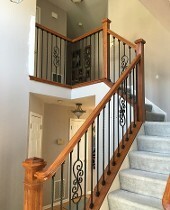 He worked with us to design a beautiful new railing and worked within our budget"
"We hired Old Bedford (Len) to rebuild our stairs and railing because of the great ratings on SM and the cost for renovations was in our price range. Work began on time and was completed on schedule and within budget. We really appreciated that Len was very conscientious of our budget and made smart recommendations to keep us within budget. while still maintaining the style level we were looking for. Len always responded promptly to all our emails and was very patient with us as we were very involved in all aspects of the project. He was prompt, every day, and started working the minute he walked in the door. Thanks Len and Ritchie!" "Great workmanship! Punctual and always reliable. 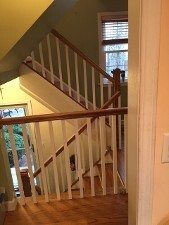 Great ideas for design and always open to client's involvement in the work process"
"We love our new stair railings from Old Bedford Fine Custom Carpentry. Len really put a lot of effort and thought into our projects. You could tell that he just didn't build something and quickly throw it up. He paid a lot of attention to detail and quality. Now I'm trying to figure out other projects I can give him"
"Old Bedford restored an entire staircase and replaced a kneewall with new oak banisters, oak treads and oak risers. His professionalism and friendly nature made every day a great experience without interruption to our normal routine.. His work is of the highest quality and I would recommend him for any carpentry needs. Thanks Len, for transforming my home"
"We cannot even begin to thank you for the exceptional work you did on designing a staircase for our condo. From the moment we began seeking your services it was clear that you were organized, precise, and diligent about customizing the job to our exact specifications. We appreciated the fact that you were willing to work within our proposed budget, when no local contractor in town would. You started and finished the project exactly when you said you would and worked quietly within our condo community without disturbing our neighbors. Working with you was a true pleasure and we could not be happier with the finished design. We have already received multiple compliments and passed out several of your business cards. We will continue to refer you to our friends and family. Thank you again for your hard work and unmatched service. 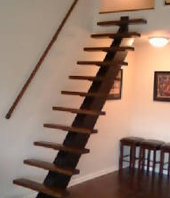 You have met and exceeded our carpentry needs and we look forward to working with you in the future"
"Len did an outstanding job with renovating our stairs. Always on time and with a keen eye for making the end result not only functional but also looking great. We have already hired him for additional work and will continue doing so. He always took great pride in his work. " 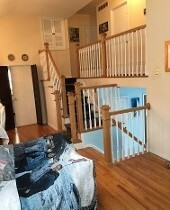 "The stairs and railings look absolutely amazing!!! They are beyond what I had ever imagined. It is, without doubt, a first class job." 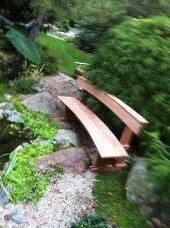 "Shaped mahogany bench built to follow the contour of our exterior gold fish pond. Outstanding professional work delivered before due date"
"This table top was built to withstand the toughest weather much like the surface of my boat. Old Bedford got it just right and we enjoy the table on the deck behind our house. The perimeter is built out of mahogany and the interior is a solid core vinyl material neither of which are likely to ever require refinishing. We like it so much that we've asked Len to build us two matching benches"
"We have an old house so when we decided to have Old Bedford replace the floor of our front porch and stairs, it wasn't a total suprise to find rot and inadquate structure to carry a new floor. Old Bedford completely rebuilt the porch and suggested beautiful mahagony boards to replace the old painted floor. The finished look makes a beautiful statement about our home. We are immensely pleased with the result and highly recommend Old Bedford for your home improvement projects"
"We have four balconies over looking the first floor and my husband felt post & baluster railing on all four would be too busy looking. We asked Len for a solution that would not block the view, be safe for our children and code compliant. 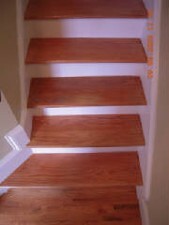 Len used clear safety glass in an oak frame finished to match the finish of the stair railings. 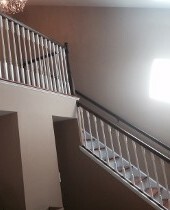 In all, Len designed and installed over 60 feet of railing in our home and we're delighted with the results"
"Len's wall frames in our foyer and up the stairs really added the extra dimension we were looking for. Great job Old Bedford"
"Thanks again. The island kitchen table looks really good & I'm real happy. I'll be in touch for future needs. Have a good day!"